The allocation system is a little different. Not saying your cousin will not get the very first one that dealer sells, and also that the dealer might not be getting an allocation in the first month or three however for your cousin — just that there are overriding factors. However the total allocation system is instead based on GM’s policy of “the more your turn, the more you earn” allocation system. So if that dealer is a very high Corvette sales volume dealer and he/she puts in your cousin’s order as the dealer’s first priority C8 order, again your cousin’s car could be built early. However, if that dealer is instead a medium or a lower priority dealer and as GM will no where be able to make as many C8’s in the first few months (maybe even the first year) as customers want, your cousin could be waiting and waiting until that dealership’s priority comes up. There is also a second consideration, and that is based on the C7 example, since suppliers can often not make enough of a highly desired option (with its unique parts), as soon as customers might want. As a specific example, in the third month of C7 orders going in through the weekly consensus,’ there were still a whole bunch of constrained options individuals wanted (best example being the visible carbon fiber top). So if there is, hypothetically, there would again be a 50% constraint on that option for the C8, GM would (based on history), grant the very top dealers all or almost all of the visible carbon fiber optioned orders they want/submit for their customers, but for a medium dealer might only have one such top for it, yet not grant even a visible CF top to a smaller dealer for that consensus. Hope your cousin gets his C8 very, very early on in the production process — with the options he has chosen. However, if a couple of his chosen options are constrained, that he is willing to compromise on them. If a person is however not willing to compromise on an option (or more than one), typically a dealer would offer that person the right to have his order “slide to a future consensus” when that option were available to be matched with the order, and then move up someone from what was a future consensus if that person was not requesting constrained options. Note, at the very beginning of a new color being offered, it too can be a constrained option, and often (but not always) a new color may be introduced into the production process around a month or more later. I think the constraints in the first year will be substantial. If I go for a C8 (seems more likely than I thought six months ago) it won't be until 2021 at the earliest, when prices drift below MSRP and some late arriving options get on the order list. But a 535 hp DCT car with a retractable hardtop at a MSRP in the $75K range sounds good. Heck, the MSRP on my 2LT 2015 A8 Z51 roadster was around $76K, and that was in 2014 dollars. Last edited by Milliwatt Rob; 04-12-2019, 07:50 PM. Last edited by John; 04-12-2019, 08:07 PM. If a person is however not willing to compromise on an option (or more than one), typically a dealer would offer that person the right to have his order “slide to a future consensus” when that option were available to be matched with the order, and then move up someone from what was a future consensus if that person was not requesting constrained options. Yea. All roofs were on constraint except transparent when I ordered my 2014. Got a call from the dealer, I'd be in line with a $1,000 transparent roof. Told him I'd pay half, He checked and they said no. So I paid and so glad. The dark roof looks great on the blade silver. I love the way when you are inside the C7 with the translucent roof, when it is daylight that you can see through it; it casts a pleasant bluish tint, and that you can see its nice curves — from either seat. Very cool looking. We see that C8’s roof, in certain spy pics, also seems to have a similar “double bubble profile” but that is something we would need to confirm 97 days from now. For $62K, a ME Corvette with 500+HP with DCT is ONE HELL OF A BARGAIN. That car isn't just for power. watch how tight that suspension is. It's going to be a FUN car to drive without breaking the bank. My Cousin just put down $50K deposit with a Miami dealer yesterday that gives him written guarantee on the MSRP price, first in the list (the list is sorted by deposit amount and not date of deposit) and the check does not get cashed by dealer (stays in bank's vault) and it is fully refundable. Basically, the dealer shows proof to GM the # of solid orders he has and can buy as many cars as deposited orders. They are first by GM (according to what he was told). Funny, he bought a Civic Type-R for $35K cash, put 4 carbon fiber wheels and tires on it. Drove it for 3000 miles and sold it for $50K. Turned around put the $50K as a deposit for a Black C8. WOW, that is crazy. LOL, I am on the fence with a builder in my area on an expensive semi-custom house because they want 5k earnest money down that is non-refundable for the entire project. The builder said the house will take about 9 to12 months to build and that my 5k is gone if I decide not to buy at closing. I know that is very reasonable, I am just a cheap A at least that is what my wife says . Last edited by Fasttoys; 04-13-2019, 12:45 AM. My earlier post is more about marketing than it is about performance. I am sure you don’t need over 500 horse power for it to perform very well. But from a marketing standpoint it is a numbers game. Last edited by fvs; 04-13-2019, 01:17 PM. The most interesting part of the video (for me) is the discussion on cam profile, that begins at 6:00. 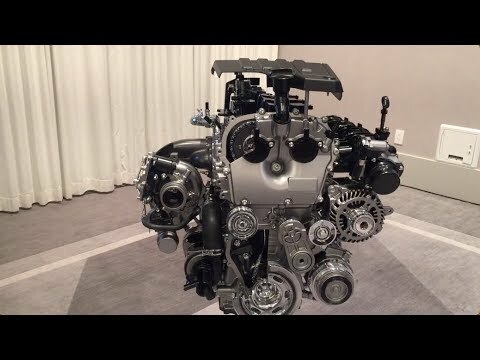 With this tech, it wouldn't surprise me if a 550 HP engine that's also equipped with cylinder deactivation could both meet emissions and get 30+ MPG highway. The LT2 (based on the LT1) with it's pushrod tech, likely won't have the variable cam. We may need to wait for the new 5.5L flat-plane crank Z06 motor. Last edited by Mobius; 04-13-2019, 07:38 PM. The Chevy small block push rod is blessed by development and reliability and loved by a faithful following. Pray that it will stay. But flat-plane crank V8 will be a great complement and alternative for those who want that experience in a mid engine C8, at a Corvette cost and, hopefully, Corvette reliability level. So, we have a lot to be wide eyed about going on 07.18.19 and the months that lead on to the DOHC flat-plane crank revelation. A lot to speculate about. Some people will want and buy the C8 in both engine set-ups at the same time for less than the out-the-door price of a 911 GT3, after they turbo load/price the 911 options as they do..
Last edited by SheepDog; 04-14-2019, 10:49 AM. Merely 500 HP in a vehicle that has top level handling will be stupendous. But sheer numbers matter. The NSX and 570 have about 570 HP and so do some others. Will that be a deciding influence on the base C8, surely on the others, but what about on the base C8?? What is the target: 911 TurboS? The training partner? Last edited by SheepDog; 04-14-2019, 11:06 AM. Like the first year C7, which won 21 major awards, the 2020 C8 with about 500 HP/TQ IMO, will be a very formidable performer. A year later, I believe the Z06 version would be schooling the top customer Porsches and the McLaren, but again we are going to need to wait another year for that version to happen. After the C8 is released, and probably very soon after, Some one or more of the tuners will surely own one, C8, and be overcome by curiosity. Then we will all get a preview of higher levels of performance in the platform. Even if not the DHOC edition. The LT4 and LT5 type engines would still make the C8 perform amazingly. There was an article yesterday that stated the C8 Z06 would come with the new normally aspirated 5.5L (more lucky 5s!) flat-plane crank engine... I'd guess that engine will be in the 675-700HP range. A FPC is highly doubtful with a displacement over 4.5L or so since the vibration would harm reliability/durability. Ford's FPC 5.2L Voodoo V8 has serious reliability issues for precisely this reason. Also, ask the GT350 owners about long road trips in their four-wheeled vibrators. Part of the Corvette's formula is that it can serve as a comfortable grand tourer so I doubt they would introduce the severe NVH issues that go with a large displacement FPC.